Pacholarz is a junior who has demonstrated a wide variety of talents while at Pope John. We at Pope John XXIII Regional High School want to share with you a new series called “Pope John Student Spotlight” in which we recognize our students’ talents and achievements! Today, we want to showcase Michael Pacholarz! 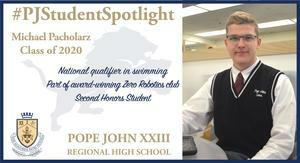 Pacholarz is a junior who has demonstrated a wide variety of talents while at Pope John. Pacholarz qualified and competed at the YMCA Short Course National Championship for swimming. Pacholarz is also a member of the award-winning Zero Robotics Club and a member of the FTC Robotics club. In addition, he has earned Second Honors in the classroom while taking courses such as Honors Physics, Honors Advanced Web Program/Security, AP Computer Science, Honors Spanish III, Honors U.S. History II and Pre-Calculus. Moreover, Pacholarz is an altar server at St. Joseph Church in Newton.